K5 Reading helps kids become strong readers. K5 Reading covers phonemic awareness, phonics, sight words, vocabulary and reading comprehension. K5 Math builds confidence in math; the program covers numbers and operations, geometry, measurement (including time and money), algebraic thinking and data analysis. K5 Spelling is an advanced spelling and vocabulary program which improves language skills one word at a time. K5 kids learn to focus and work independently. K5 allows kids to progress, unrestrained and un-pressured. K5 organizes, instructs, and quizzes your child and provides reports to you. We use simple interfaces, spoken instructions and bite sized lessons. No ads, no chat, & no external links. 100% online. No downloads and nothing to install. Our content is award-winning, research-based and aligned with national standards. Each online lesson is accompanied by custom worksheets providing greater depth in the concepts learned. We personalize our program to each child’s skills, not their age or grade level. We provide full instruction, allowing kids to tackle new topics they have not seen before. Kids don’t watch our lessons, they interact with them. K5 Reading, K5 Math and K5 Spelling are all included for one price. K5 Learning's online reading and math program is for kids in kindergarten to grade 5. We build reading, math and study skills. K5 Reading helps kids become strong readers. The program covers phonemic awareness, phonics, sight words, vocabulary and reading comprehension. K5 Math builds self confidence in math. K5 Spelling is an advanced vocabulary program which improves language skills one word at a time. 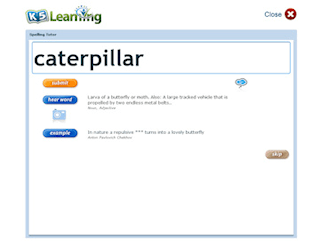 K5 Spelling's adaptive test-study’ approach, automatic word generation, optimized visual interface, 150,000 word database and continuous tracking of each student's spelling and misspellings is far beyond your typical online spelling program. All online reading and math lessons are accompanied by custom worksheets for additional "offline" study. We provide full instruction, allowing kids to tackle topics they have not seen before. Kids don’t watch our lessons, they interact with them through our animated 'role model' characters. Note that our lessons our flash based, and will probably not work on your mobile device. If you want to signup for our 14 day free trial, you'll need to visit us using your desktop or laptop computer or Chromebook.